Balance is something that most people are born with and develop in the first few years of life. At the same rate, as we age, we begin to lose it. BUT, it is never too late to start working on your balance. Below are some ideas but first it is important to understand what gives us balance. If you deficits in any of these the body has to compensate through the other three components to maintain balance. This is similar to someone who is blind develops a good sense of smell and hearing to make up for inability to see. Some people are born or work hard to develop some of the components above to become excellent at balance. Professional athletes have superior components of balance. This is in part to exercising the proprioception, strength and, visual system to improve reaction times and precision of power required to excel at their sport. Through vigorous training and repetition of activity, they become experts. Not all people are born with superior components of balance. When we age and become more sedentary proprioception, vision, strength, and the vestibular system begin to decline. As balance declines in older adults, fear of falling promotes lack of movement and these systems become even weaker. This can be delayed by exercising and maintaining each system. The vestibular system is highly developed in the early years of life as toddlers and children are playing on merry-go-rounds, teeter totters, monkey bars and swings. These toys can all be found in playgrounds. Other games that we used to play are “upsy daisy”, “bucking bronco” on your dads knee, and “rocket launcher” in the swimming pool. Bounce Houses are one of the most popular events at birthday parties. Kids become obsessed with these games and toys. They focus on inversion, foot/hand precision, rapid change of direction, and strength to enhance our vestibular system. Without even realizing it parents are helping developing their child’s vestibular system. These children become fearless if balance is developed properly and early in life. Before you know it, those kids are zooming down the mountain without ski poles and doing flips on the gymnastics floor. The minute we stop exercising our balance, we begin to lose it. Athletes will continue to enhance or maintain balance through their sport however most sports do not focus on inversion, heights, or rapid change of direction on an unstable surface. Gymnastics is one of the most popular sports for young children and involves jumping, hanging, and flipping. Unfortunately, many kids do not continue past age 8-10 with it. Recess time and PE classes are cut exponentially until middle school. The kids who do not participate in sports are left in the dust and vestibular systems begin to decline. As we become adults, unless we practice inversions in yoga, take part in rock climbing, mountain biking and sports alike we become deficit in our tolerance to positions other than upright. If one other component of balance is lost – strength, vision, or proprioception – risk of fall is exponentially increased. The “use it or lose it rule” becomes vital to long-term maintenance of balance. This is already common knowledge as many people are practicing their single leg balance (for proprioception), strengthening their core/hips with gym programs and getting their eyes checked for long-term optical health. How do we exercise our vestibular system? As physical Therapists we have people do balance exercises (such as single leg standing) with eyes closed. This takes away vision to force the vestibular system and proprioception to compensate. Great exercise but…Boring. Instead, I say we all resume childhood games. Play at the playground: go swinging merry-go-round, order a Bounce House for your next bar-b-que at the park. If you have kids, play the same games with them. Start doing somersaults and hand stands on the wall like you did when you were 6 years old in gymnastics class. This would be the fastest way to start exercising your vestibular system. If you want a more organized form of exercise, take Yoga, go rock climbing, or enroll in a trapeze class. It will be fun and will keep you on your feet longer with less chance of falling. And, it is never too late to start. 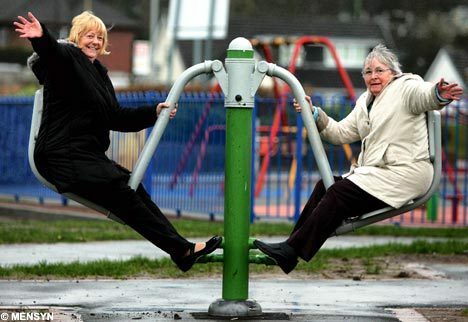 There is no reason why your 80-year-old grandma can’t get on the swing set with the grand kids. Use it or lose it for prolonged vestibular function and balance. Since my mTBI I’ve had so much more difficulty with balance (how did I get that bruise?! ), and motion sickness when driving or on the boat, so I don’t think I’ll join you on the swing or merry-go-round, but I do take your point about movement keeping your vestibular system going (I prefer to do it underwater while SCUBA diving!). What ever the vestibular system can manage, you got to keep exercising it. If the vestibular system is not making appropriate modifications, continue exercising the other 3 systems that regulate balance. Wow – scuba diving. That works the system. I am curious about other ways you worked on your balance after your TBI. Thanks for the comments. I think this is a great topic, and well written article. This type of training doesn’t have to be boring, though. Using constant measurable feedback while doing your core, hip complex, and balance training makes it challenging and enjoyable to most. My training facility is best known for our balance and “range training”, and even attracting the most aggressive of athletes. Keep up the great work, Jess! Thanks for the comments! Yes I am in San Francisco. I agree balance training is a lot of fun if done correctly…gotta keep it interesting for the client. I will have to check out your “range training.” Looking forward to sharing info. Any recommendations on how to go about this slowly as I get extremely dizzy when I simply roll on the floor. Thx! Hello Brenda. It sounds like you need to be assessed first to find out if it is related to your inner ear. Great article, I couldn’t find a way of messaging you privately but I think you’ve had a bit of an oversight with the picture of the boy by the sea at the top of your article. He has a very unfortunate rip in his shorts that makes the picture quite inappropriate. Just wanted to make you aware because I’m sure you haven’t noticed. I won’t be offended if you delete this comment after changing the pic! Thanks Stuart for taking the time to write me. I guess I didn’t notice that on the picture. Very effective training of vestibular apparatus is wearing of invertoscope or pseudoscope!